those who did not suffer physical aggression. ment of the CCED professionals. intimidation, mobbing, harassment, and threats . abused and one in four was physically assaulted . (28%) reported the highest rates of violence . more than half of them . followed by orderlies (18.2%) and nurses (17%) . 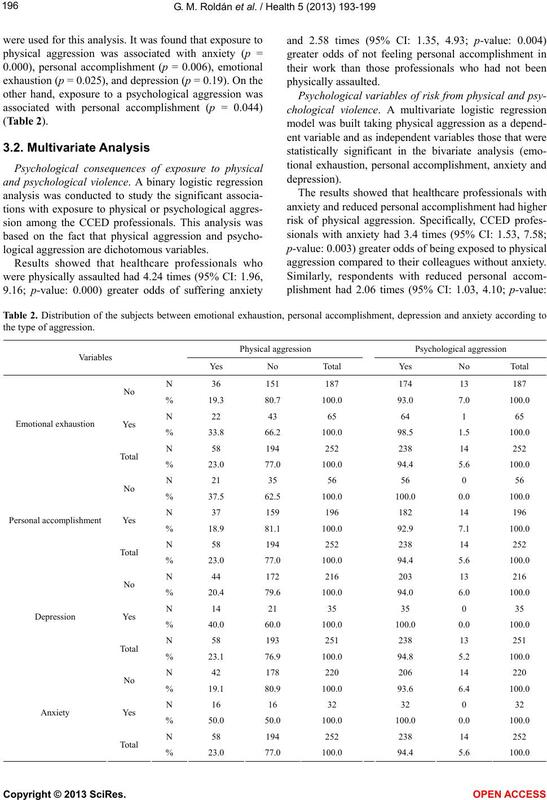 of aggression was verbal (6 5% )  . derlies and ambulance drivers (13.4%) . levels of anx iety  and burnou t [3,8]. crease the risk of exposure to violence in the workplace. vices of the Andalusian Health Service (Spain). aOrd. & amb. = Orderlies & ambulance drivers. of the BAI was of 0.93.
categories. Chi-square (χ2) or Fischer (F) tests were used. variables evaluated, and vice versa. the agreements of the Helsinki Declaration. logical aggression are dichotomous variables. 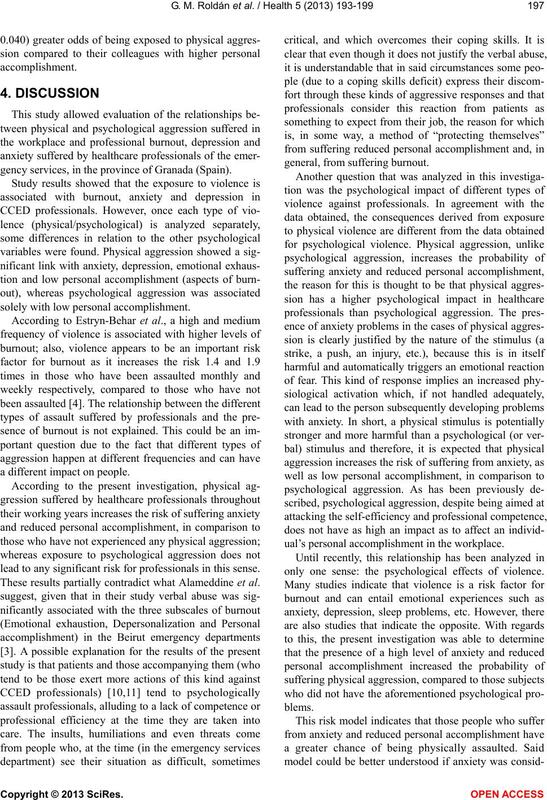 aggression compared to their colleagues without anxiety. gency services, in the province of Granada (Spain). solely with low personal accomplishment. a different impact on people. lead to any significant risk for professionals in th is sense. 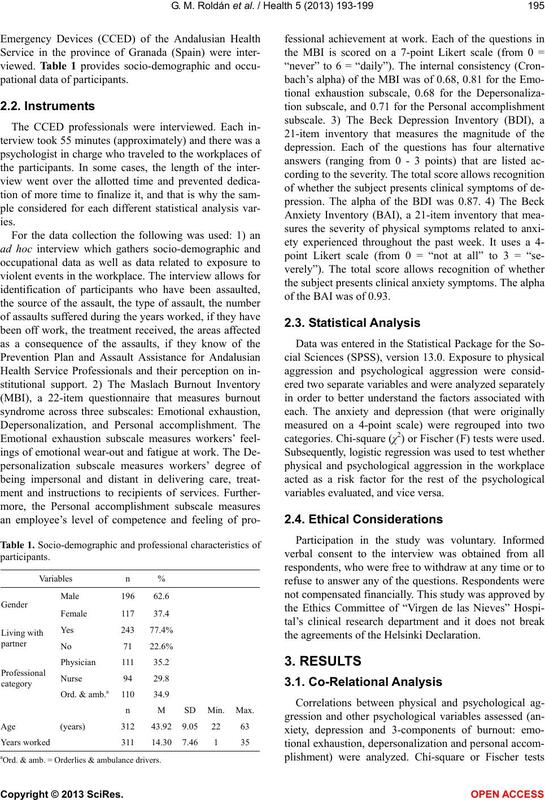 These results partially contradict what Alameddine et al. ual’s personal accomplishment in the workplace. 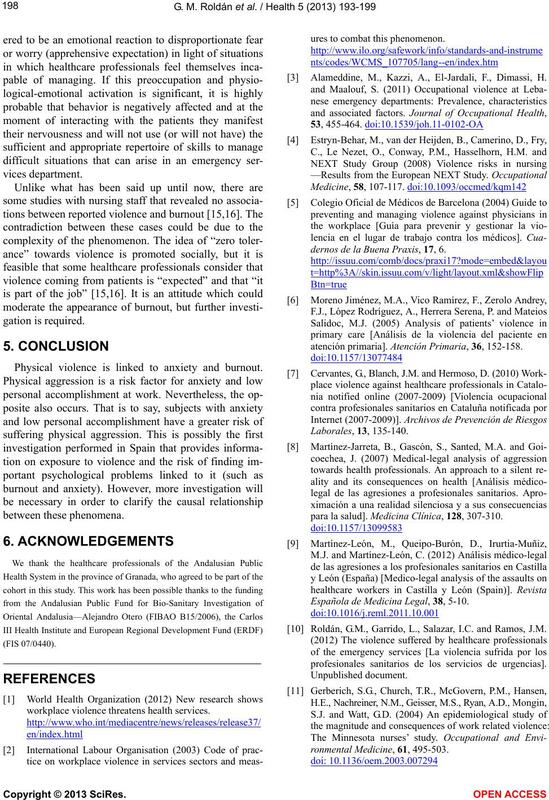 only one sense: the psychological effects of violence. 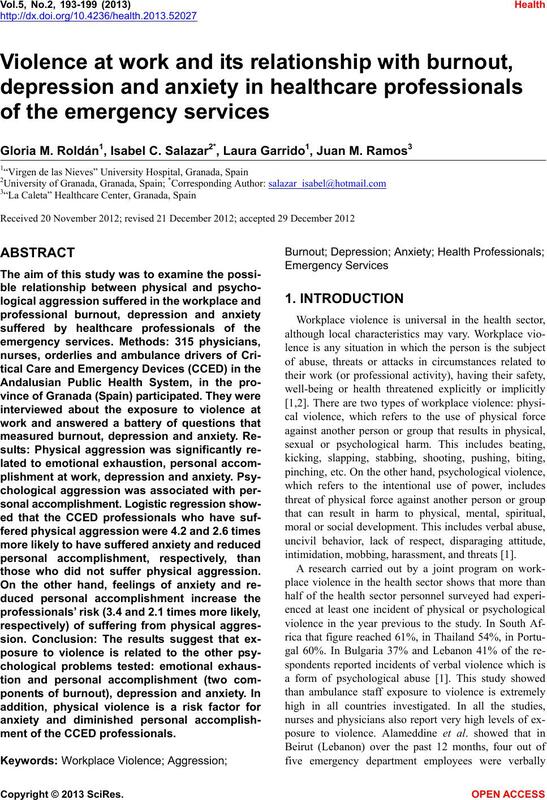 Physical violence is linked to anxiety and burnout. 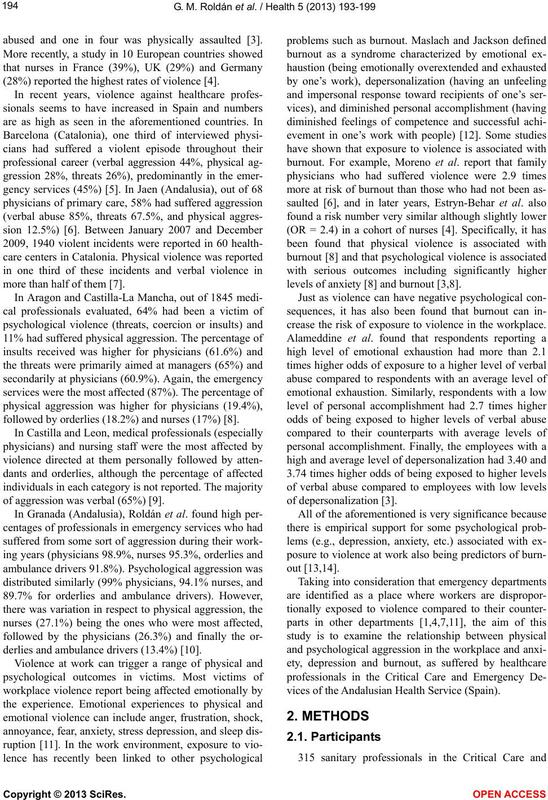 workplace violence threatens health services. ures to combat this phenomenon. Alameddine, M., Kazzi, A., El-Jardali, F., Dimassi, H.
dernos de la Buena Praxis, 17, 6.
atención primaria]. Atención Primaria, 36, 152-158.
para la salud]. Medicina Clínica, 128, 307-310. Española de Medicina Legal, 38, 5-10. Roldán, G.M., Garrido, L., Salazar, I.C. and Ramos, J.M. profesionales sanitarios de los servicios de urgencias]. vices Survey (MBI-HSS). Health, 4, 644-652. Roldán, G.M., Salazar, I.C., Garrido, L. and Ramos, J.M. era: Associations with burnout and length of experience. 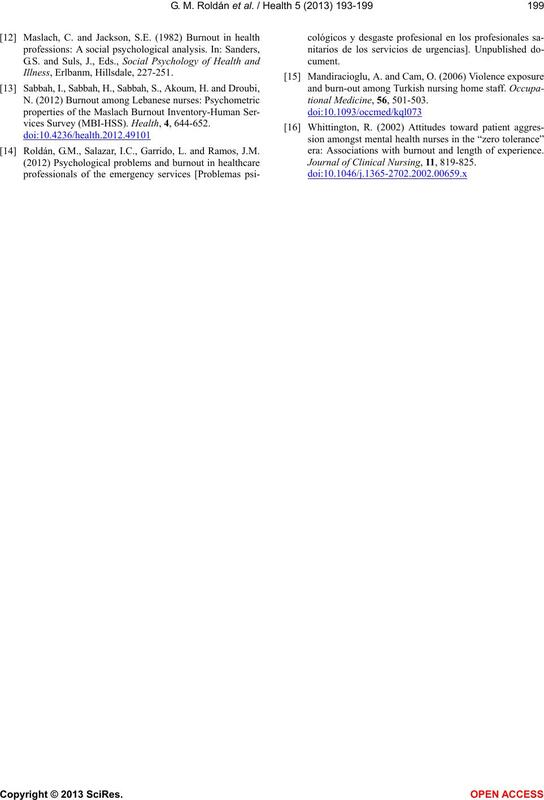 Journal of Clinical Nursing, 11, 819-825.